Learn the real behind the scene story at Chevrolet Motor Division documented by Zora's files and those of Chevrolet executives Ed Cole, Maurice Olley, William Wolfram and many others. Discover Chevrolet's first two secret experimental Opel/Corvettes built in 1952 and early 1953 and how Chevrolet pulled off its "staged" June 30, 1953 Corvette production without any real production Corvettes ever built! The General Motors Institute 1953 Corvette Legend is finally proven TRUE! The two 1953 Corvettes used at the staged June 30th 1953 event were "built" at Plant #35 in Flint and not at the Flint Van Slyke Road Plant! Discover how and why! How did Zora Arkus-Duntov really arrive at Chevrolet Research and Development? What role did US-SAC General Curtice LeMay play in Zora's hiring? How did Zora keep his job at Chevrolet and drive European car's at three Le Mans races from 1953-55? 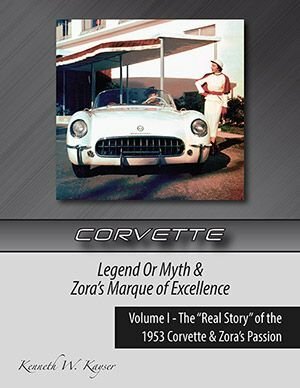 Discover Zora's back channel communications with Ed Cole and their undisclosed secret projects; Zora's first mid-engine 1953 Corvette and his V-8 HEMI Cylinder Heads before the V-8 engine even went into production in mid-1954! Discover the remarkable histories of the 1938 Chevrolet Tonawanda Motor Plant, the 1953 Chevrolet Flint Van Slyke Corvette Assembly Plant, the 1954 St. Louis Corvette Assembly Plant and the 1955 Chevrolet Flint V-8 Engine Plant and their combined role during the 1953-55 Corvette program. Discover 1952-53 eyewitness accounts of Bill Beyer, Bob Wilson, Joe Bentosky, George McGriff and Carl Jarema that forever "correct" the real Corvette history and timeline. Do you know what the Opel Sports Car was named before it was changed to the Corvette? Do you know that Rochester Fuel Injection was an official project for the 1953 Corvette inline-six engine? Do you why the Corvette body was Fiberglass and how the US Government played a role in GM's decision? Do you know the role that WWII and the US Department of Defense played in the ultimate 1950's success of General Motors, Chevrolet Division and the Corvette? Discover Harlow Curtice's successful "Billion-Dollar GM-Chevrolet Gamble" and Ed Cole's subsequent "Million-Dollar Corvette Gamble" to save the 1953 Corvette from certain demise before it even reached its production starting gate. Chevrolet's 1953-55 Corvette miss-information was deliberate and purposeful. Corvette's "Real Story" is mind boggling and far more intriguing than its old fanciful tales! 502 Total Pages ~ with Color Photos on 160 pages where available! 8.5" x 11.0" x 1.5" Signed by the Author ~ With Additional Personalization Available! $99.95 Retail Price Now Only $89.95 to All Corvette Club Members! To Pay By Check Download the "Order Guide & Personalization"